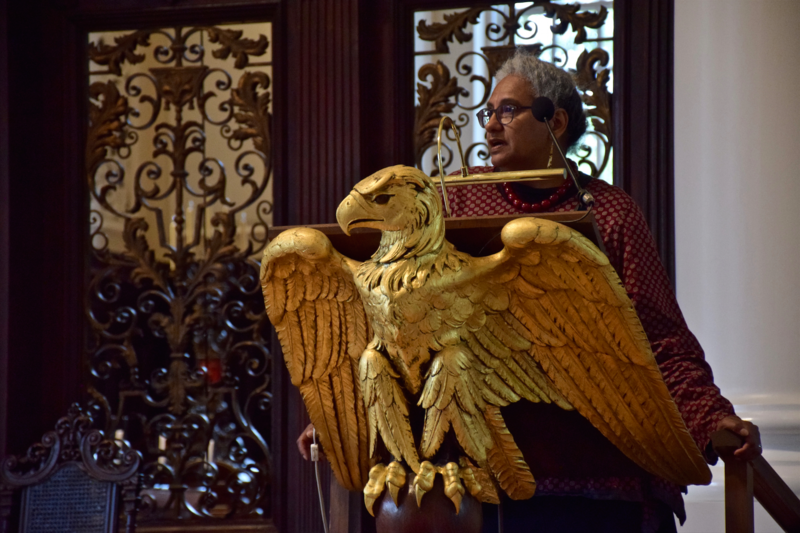 Elizabeth Solomon, a member of the Massachusetts Tribe at Ponkapoag and the Assistant Director of Academic Affairs and Fellowship Programs at HSPH, speaks at the College's inaugural Latinx Convocation. The ceremony, the title of which translates to “My Roots, My Community,” was organized by Latinx student leaders in order to welcome students of Latinx heritage in the Class of 2022. Genesis N. De Los Santos ’19, one of the student speakers, spoke of her upbringing in Dorchester, Mass. and her experiences and growth at Harvard. “Whatever paths you trekked to get here, whatever mountains our ancestors climbed, whatever borders they crossed — both the physical and theoretical — we have achieved the unfathomable,” De Los Santos said. Mariachi Veritas opened the ceremony and played several songs before the speakers addressed the audience. The ceremony was followed by an evening reception with light refreshments in Teresita Fernández’s art installation in Tercentenary Theatre, called “Autumn (... Nothing Personal).” First-year students were congratulated with roses as they mingled among peers and speakers. Angel A. Mata ’22, who is of Venezuelan heritage, was one of the several dozen first-year students at the event. “Coming to Harvard is very different. I didn’t really realize how much I’d miss that part of my life,” Mata said, referring to his upbringing in Florida in a predominantly Latinx environment. Elizabeth Solomon, assistant director of academic affairs and fellowship programs at the Harvard School of Public Health and a member of the Massachusetts Tribe at Ponkapoag, was one of many faculty members and administrators to speak at the convocation. She acknowledged the history of the land where Harvard stands and its ties to the indigenous people of the region. “When indigenous communities in the United States gather together, they traditionally acknowledge the ancestral holders of the land they are meeting on,” Solomon said. In addition, a few faculty members addressed Latinx Convocation guests. Among them were María Parra-Velasco, a senior preceptor in the Department of Romance Literature and Languages; Brian D. Farrell, Leverett House Faculty Dean and a professor of Organismic and Evolutionary Biology; and Alejandro De La Fuente, a professor of Latin American history and economics. Dianisbeth M. Acquie ’16, a second-year Law School student and Lowell House resident tutor, said she was involved with the Latinx community during her time as undergraduate, including as vice president of Fuerza Latina. In her speech, she told first-year students that it was “remarkably brave” to leave their homes and chase that “beautiful dream” at Harvard. A previous version of this article misspelled the name of Alejandro De La Fuente. It has been updated.